They figure largely in the stories I know and love, from the Billy Goats Gruff through Horatius at the Sublician Bridge. Concord, Kwai, Remagen, and Khazad-Dum. Almost always at a moment of reckoning, in a crucial juncture in some history. Of course, we wouldn’t know these bridges were it not for what happened on or across them. But they are a transitional structure, liminal and also rhetorical in their insistence that they are the one and only way across a stream, a river, a gorge or chasm. Perhaps we make them beautiful because they embody a language of connection—of links between what we know and what we have yet to discover. 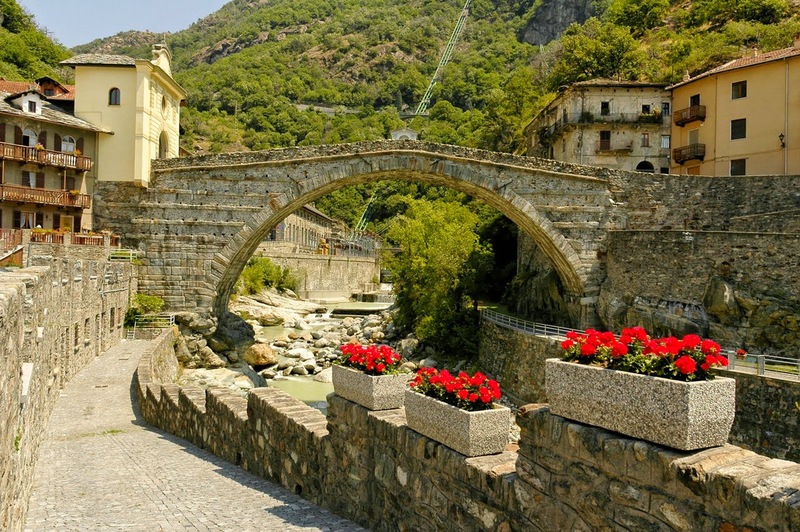 Among its Roman ruins, the Aosta Valley contains three notable bridges: the Pont de Pierre in the town of Aosta itself, the Pont-Saint-Martin, and the Pont d'Aël. All are remarkably preserved—the Pont de Pierre a bit occluded and domesticated by the late medieval buildings that surround it—but each suggests at more than a simple overpass or viaduct. They are part of the Roman language of conquest, if you look at them carefully and consider what you see. Of the three bridges, the Pont-Saint-Martin (built probably sometime in the 1st century BCE) is the most famous. A medieval legend has attached itself, and it goes something like this: Saint Martin, the Bishop of Tours, was returning to France, but found his way blocked by the river Lys, which had swept away the only crossing passage during a flood. The resourceful saint cuts a deal with the Devil, who promises to build a bridge over the river in exchange for the soul of the first one to cross it. Martin accepts the proposal, but in a nice reversal of the “devil in the details” stories we all have heard, triumphs on a technicality: he throws a piece of bread across the river, enticing a hungry dog to cross, thereby foiling (and infuriating) the devil, who vanishes in the river with a sulfurous explosion, leaving the bridge behind. The carnival at Pont-Saint-Martin celebrates this confrontation, and concludes by burning an effigy of the devil under the bridge. Everyone recognizes that our style of living when we travel is much different than when we stay at home. The anonymity of the hotel room, the level of observation when sights and sites that are everyday to a resident are things that we, as visitors or vacationers, see for the first (and possibly the only) time. Understandably, there’s a tolerance (especially in tourist areas) toward the blunders and misdirection of strangers: despite American tourists’ return to the States with horror stories about our mistreatment at the hands of resentful locals, I’ve received far ruder treatment from my countrymen than I ever do from people I meet abroad (though I’m sure the Italians have their share of inhospitality, you’re not very likely to find it in a tourist area, where livelihood depends on courtesy to strangers, and sometimes even the most discourteous ones). So it’s different when you travel from when you stay. But when have you ceased to tour and begun to take up residence? I think I have a domestic streak that finds myself at home readily—a lucky quality to have as a traveler. When I return to lodgings after only several days, there is a sense of gaining my bearings, as though some interior sense of balance is restored in the play where I am staying, the vestibular system signaling my acclimation, the road anxiety kicking back into my recesses. The flat in Aosta with its long corridor, bulky, almost monumental furniture, and glimpse of the Alps over the rooftop (I've inserted pictures of both), became home within the week, and the neighborhood became my neighborhood (after one irritating and hot afternoon of getting lost only a block or two from the place). I adjust easily: as habitual as the old man I am becoming, my first trepidation at any change falls away quickly, and I find the routine in the strange and set my feet there. But how does the transition go? When do we stop visiting and start staying? You begin to stay, I think, when domestic tasks return to your daily patterns. You cook at home, clean the apartment, shop for groceries and for little, temporary items (a paring knife, a cheap alarm clock) unavailable in the place you are staying. The curiosity of Italian supermarkets—handling the fruit and vegetables with plastic gloves, large butcher shops and a dearth of pre-packaged meats, the glory of an extensive wine aisle—becomes customary eventually, and you adopt a version of the pattern you had at home. You begin to stay when you learn your neighbors. When you have neighbors, actually. The woman at the laundry who knows no English and negotiates task and cost through signs and pantomime, the brilliance of her invention a source of marvel to you at first, but customary as you return. The barber who slyly compliments your virtually non-existent Italian, and reveals on the second visit that he was a jazz drummer back in the day, in Greenwich Village, showing you his CD, where his own able compositions are fitted among popular standards like “Over the Rainbow” and “Someone to Watch Over Me”. The lovely green-haired young woman behind the counter in the bakery, who begins to use your visits as an opportunity to learn English and progresses remarkably as the weeks unfold, her learning curve a product of intelligence and youth, but also an intense curiosity about the world around her.